On the TV show Mad Man, Don Draper walks into his office every single day and pours a drink. It’s not Happy Hour, but something like 10 AM. During the rest of the day, he is sure to consume quite a few of those, and of course there will be the three-martini lunch and a few more cocktails before dinner is finally served. That kind of behavior would be unacceptable today. Starting from the mid-70s when a tee totaling Jimmy Carter denounced the ‘$50 dollar lunch’ as a damaging tax write-off that was actually being subsidized by the working class, the idea of drinking during the day became less and less tolerated. These days, being mildly intoxicated at work may cost you your job – but really, should it really be that way? I recall that when I was working at a bank in Sao Jose dos Campos, a mid-size industrial town about 50 miles from Sao Paulo, restaurants would always include feijoada, a stew made with black beans and pork on Wednesdays, and the dish almost always was served with a complimentary caipirinha. We would eat, drink and go back to work, no issue or problem about it (and yes, the management would do the same). Whether such findings might not be entirely true (I don’t eat lunch in restaurants, so I have no way of verifying that), I think that loosening up today’s alcohol policies could be beneficial, as long as people are responsible about it. Sure, there will always be those who prefer to eat at their desks while doing something more productive like updating their Facebook statuses or staring at a spreadsheet, but at least there will be an option. In a cocktail cup, mash the lime and sugar together with a pestle. Add ice and cachaca and shake. Serve in tall glass. Rub salt and chipotle powder around the rim of a margarita glass. Add tequila, peach liquor, orange juice, 2 dashes chipotle powder, simple syrup and lime juice to a shaker filled with ice. 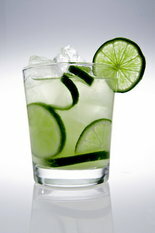 Strain or serve over the rocks and garnish with lime wheel. Now, about the three martini lunch. I think it is fine. I used to find that a few drinks at lunch made the rest of my day go ever so nicely. Problem was I could not stop at a FEW drink. The rest of my team could and often did so. No objection to a few drinks at lunch as long as you can maintain control.